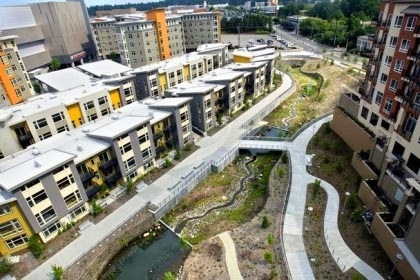 Images: Sherwood Eng, Washington Edu, Seattle PI, Mithūn Arch. "Revitalizing and rethinking suburban developments offers a wealth of opportunities to builders and architects, says Ellen Dunham-Jones, who is overseeing Sustainable Communities for the Hanley Wood Sustainability Council. A lot of your work focuses on the suburbs. What are the opportunities there? The opportunity is that we get a do-over. We built so much, but no one was thinking about environmental issues, especially when it came to the immediate postwar buildings. We drained wetlands. We built with excess. Now that so many of those properties are failing or underperforming, we have a great opportunity to redevelop them into more mixed-use, urban places, or to regreen spaces where we never should have built in the first place. What do you mean by “regreen” them? In some cases, especially if there is a slow market, it makes the most sense to simply tear a building down and replace it with a park. 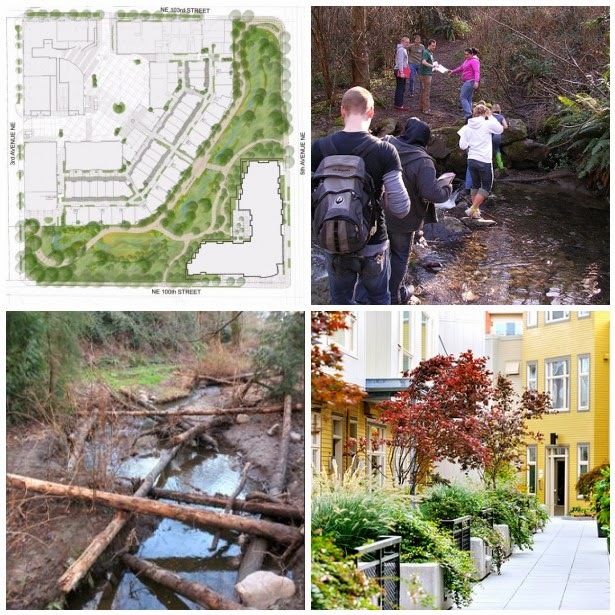 Sometimes it means reconstructing wetlands or daylighting creeks that had been put into culverts under parking lots, or putting in community gardens. Outside of Minneapolis in the low-income suburb of Phalen, there was a big strip mall built in the 1960s. It was built before the Clean Water Act, when it was perfectly normal to drain wetlands and put a culvert under the parking lot. The site also happened to be on a major migratory route. Well, the strip mall died and so did the culvert. People at the University of Minnesota’s landscape program made a case for reconstructing the wetlands. They built a beautiful lake and created lakefront property that attracted the first new private investment in over 40 years, which also happens to be next to a big public housing development. This helped trigger improvements to the public housing. The dead strip mall was bringing property values down. So, regreening the space served multiple purposes.